Host country Mozambique soon to be declared mine-free. 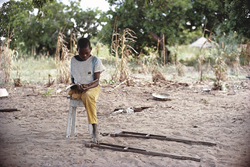 Handicap International is urging governments to significantly increase funding to support victims of landmines, as the Meeting of States Parties to the Ottawa Convention (Mine Ban Treaty) begins today in Maputo, Mozambique. The location of the conference is particularly symbolic: once the world’s most heavily landmine contaminated country following decades of war, Mozambique is mere months away from being declared mine-free—an 18-year effort of historic proportions. The people of Mozambique will be free to farm their fields and walk across land without the fear of being killed or injured by a landmine. While demining operations are coming to a close, Mozambique’s work is far from over. A comprehensive Handicap International study in 2013, found acute needs among Mozambique’s thousands of landmine survivors. The results are unequivocal: 86% of survivors interviewed had limited or no access to work. More than 96% stated that there are no adapted care services close to their community. Yet, worldwide funding earmarked for victim assistance has been dramatically reduced in the last few years, constituting less than 5% of the funds designated for mine action. Mozambique has a duty to assist the thousands of mine victims among its population, as stipulated under the Ottawa Convention. “We hope that governments will take into consideration the still very real needs of the people of Mozambique and continue helping us after the demining operations have been completed,” says Adérito Ismaël, Head of Handicap International’s demining operations in Mozambique. During the week-long, Third Review Conference of the Convention, the States Parties to the Mine Ban Treaty will review recent advances and lessons, and form a new, five-year plan with which States Parities will be expected to comply. A Handicap International delegation will work to see that the commitments made by the States address the current needs of affected populations, including a significant increase in the funds allocated to assist victims of landmines. Handicap International will also continue its pressure on the 34 States that have yet to join the treaty, such as the U.S., to make a firm commitment to banning anti-personnel landmines by joining the treaty without delay. President Barack Obama launched a landmine policy review in 2009, to determine if the country should join the Mine Ban Treaty. Five years on, no announcement has been made as to its findings. The U.S. position contrasts with its otherwise exemplary behavior. The U.S. is the leading funder of anti-mine action. The U.S. has not used anti-personnel mines since 1991, has not produced any since 1997, and ended exports of these weapons in 1992. Present in Mozambique since 1986, Handicap International has been one of the country’s leading mine action operators since 1998. Today, the demining team consists of 136 people. Its goal is to clear mined areas in the provinces of Sofala and Inhambane, home to almost 82% of the country’s contaminated sites. In 2012, Handicap International decontaminated more than 3.7 million square meters of land and restored it to the local population as part of a large-scale manual and mechanical demining operation, assisted by dogs trained to detect the presence of these weapons. The organization combines these operations with mine risk education activities to help prevent accidents. Handicap International also provides support to survivors of accidents caused by mines and explosive remnants of war, including the promotion of inclusive education and employment practices.